These are super soft and melt in mouth dessert. As these are rolls of fruit jams, these are called Jam rolls or Swiss rolls. First grease aluminium tin of 10" x 6" with butter. Now place a butter paper of the same size over it and again grease the butter paper with butter. Keep it aside. In a deep bowl, take eggs and castor sugar. Mix ingredients well and beat them with an electric beater for few minutes till gets light and fluffy. Now add plain flour and vanilla essence and mix gently with the help of a spatula. Transfer the batter in greased tin and bake in pre-heated oven at 200 degree C/400 degree F for 8 minutes. Take it out from oven and allow it to cool slightly. As it gets slightly cooled, loosen the sides of the cake using a sharp knife. Now use a clean and fry surface for further process. Sprinkle the powdered sugar evenly on surface and invert the cake tin over it. Slowly peel off the butter paper and discard it. Using broad knife, apply the jam evenly over the cake and roll the cake gently from one side to the other to form a roll. Now cut it into 7 equal portions using a sharp knife. 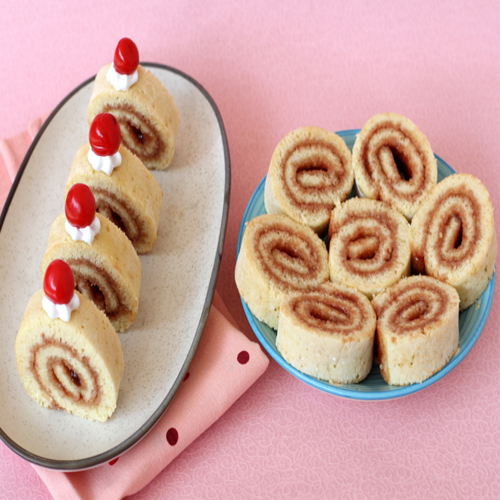 Delicious Jam Rolls are ready to eat. Serve immediately or you can store it.